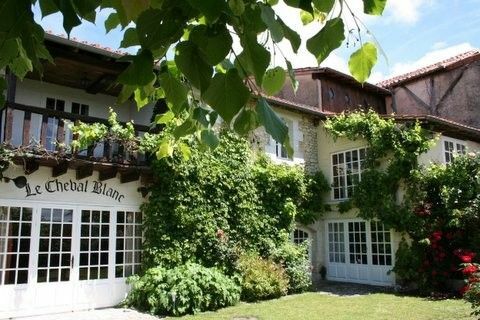 Le Cheval Blanc is a large, but intimate and homely self-catering property in the Dordogne providing luxurious accommodation and an exclusive swimming pool at non-luxury prices. We can sleep at least 14 people in 7 big ensuite bedrooms. Your destination is a rambling 19th Century farmhouse in the heart of the Dordogne countryside. It is situated in the tiny secluded hamlet of Joubertias just 5 minutes drive from the charming market town of Riberac where you will find supermarkets, shops, restaurants and banks. Venture just a little further and you will find the mediaeval town of Brantome (the Venice of the Dordogne) and, of course, all the attractions that the wine regions have to offer. Experience has taught us that happy children make happy parents, so we pride ourselves on being baby, child and family friendly. Please contact us to hear more about our facilities for those travelling with babies and young children to make your family holiday as stress free as possible. Guest book comments: Everything was even better that we expected. One week really is too short. **Merci beaucoup pour votre accueil. Je y a des adienes a recommender Le Cheval Blanc sera couru en Mosell, en Normandie, en Ile de France et en Picardie. **We were really impressed by the website but when we got here the wow factor really kicked in! Idyllic location, fantastic rooms and such attention to detail. There was nothing that wasn’t provided. **A very peaceful and relaxing time. Everything we could wish for was here, in beautiful surroundings. We’ll be back, and that’s a promise! **Le Cheval Blanc is lovely and your attention to all those little details make a real difference. **We’ve had a wonderful family holiday – le Cheval Blanc is the perfect venue for such reunions. Finishing touches make the place a home. **Wonderful place. Lots of little touches make it feel like home from home. Thank you for your kind review. We look forward to welcoming you for your sixth visit next year! We were a group of three families with six children ranging in age from 6 to 17. Le Cheval Blanc had everything we needed to ensure we all had a fabulous time. We chose this particular property because of the communal spaces and were delighted to find that they lived up to all the expectations. We arrived during some of the hottest days of this summer so it was straight to the pool which was a superb area, complete with plenty of sun beds, umbrellas and pool toys to keep everyone happy. The pool fridge and outdoor cups etc were also very useful to ensure we weren't constantly trekking back indoors for supplies. At mealtimes the outdoor dining area was well positioned and the barbeque utilised for lovely exterior dining. During the heat of midday the children adored the fabulous TV room and in the evenings the lounge/bar area was great for family games and socialising. We loved the gazebo and garden swing but didn't manage to make the most of the indoor dining table and glitter ball! We also managed to drag ourselves away for a few days sightseeing and even a group kayak outing, all very local. All in all it was an entirely enjoyable and memorable holiday. As a group ranging from 8 to15 persons, we have had an annual France holiday for the last 15 years. This property is the best equipped that we have stayed in so far. The quality of the bedding in all the bedrooms was good as was the kitchen equipment. The house is full of character and spacious. I was also a nice touch having a pool fridge to save walking back into the house to grab a cold drink. The host were very helpful & always on hand without being intrusive. The only very minor negative was that the layout of the kitchen resulted limited work surfaces if multiple people were preparing food at the same time. We were a group of eleven friends, mostly from the UK but a couple from Australia. The house was equipped with everything you could think of in your own house. There are three eating areas, one by the pool, all seating fourteen. We toured the local area a few days - which is fabulous - but just loved sitting by the pool, or a quiet spot if you just wanted to read, catching with old and recent "gossip"
We flew into Bergerac which is just an hour's drive.